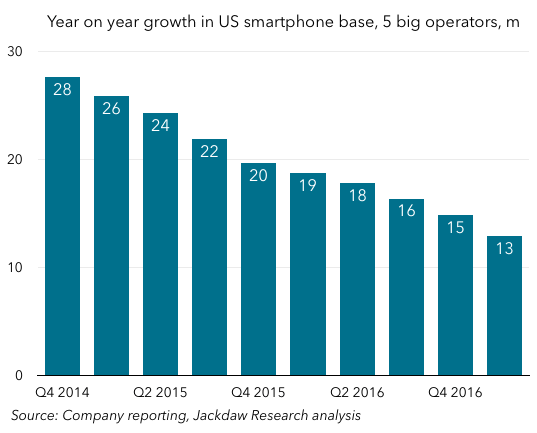 The US smartphone market is maturing rapidly, with the vast majority of US phone users now using smart rather than feature phones. As a result, growth is slowing dramatically. That, in turn, means the vast majority of market share gains will now come from customers switching behavior between vendors and platforms rather than from new users and sales growth will come almost exclusively from switching and upgrades. 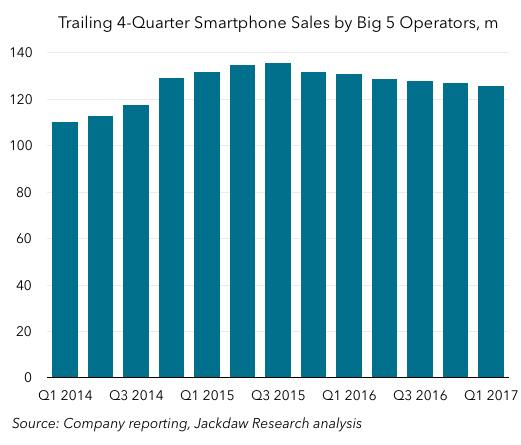 That decline really began to kick in after the iPhone 6 bump was over, in Q4 2015, which was the first decline ever in annualized smartphone sales in the US market. But it has continued since then. That’s the result both of the smaller number of new smartphone customers in the market, as seen in the first chart, and the slower upgrade cycles I mentioned. Convincing people who own a competing smartphone to switch to one of yours. 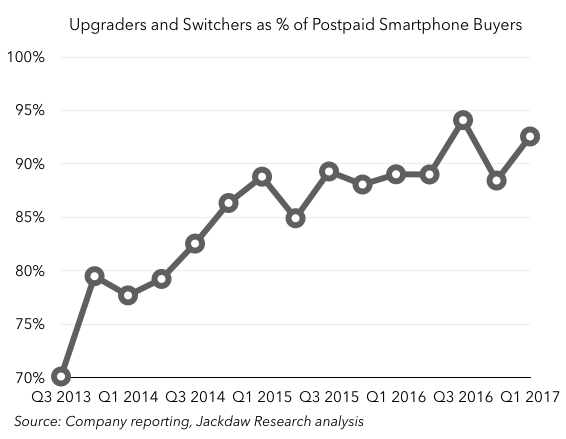 It’s no coincidence, therefore, that Tim Cook has mentioned upgrade and switching behavior repeatedly on the last few Apple earnings calls – these two behaviors will make up the bulk of iPhone sales in many markets around the world. It also helps to explain why we saw Apple this week launch a new section of its website specifically targeted at switchers from Android. This is where many of Apple’s customers will come from in the future, especially in the US but also in many other markets. It also means smartphone vendors in the US and other mature markets are going to have to make the upgrade argument more explicitly. Given the relatively high loyalty rates for some leading brands, switching is going to make up a minority of total sales and many sales will come from within the base. In the past, the carriers’ pricing and upgrade policies around smartphones drove people towards a two-year cycle and though that was never the universal pattern, it held true for many people. But now, under the new installment and leasing plans, that default two-year upgrade has gone away and been replaced by an average closer to three years. As such, there’s an enormous amount of additional smartphone sales to be driven by making the case for people to go back to a two-year cycle and for a smaller number to adopt a one-year upgrade cycle. The value here is obvious – on a base of 100 million phones sold over the last three years, a three-year upgrade cycle suggests 33 million phones sold a year, whereas shortening it by six months to 30 months drives 40 million sales a year. Shortening it by a full year to 24 months would drive 50 million a year. As such, there’s a massive incentive for vendors to drive upgrades and we’re going to see an increasing emphasis on that factor in the coming years across the board. Arguably, some Android vendors are already trying to drive faster upgrade behavior with poor operating system upgrade support after the first eighteen months or so, while Apple has introduced the iPhone Upgrade Program to drive one-year cycles for at least a portion of its base. Leasing or “device-as-a-service” models like these are going to grow in popularity and they’re increasingly going to be driven by the smartphone makers themselves rather than just the carriers. That also fits with a broader push towards subscription models for nearly everything in our digital lives. We should expect those programs to increasingly layer on other elements including insurance plans for devices, content services, additional devices like wearables, and so on.